Dole was lauded by a succession of Washington officials. 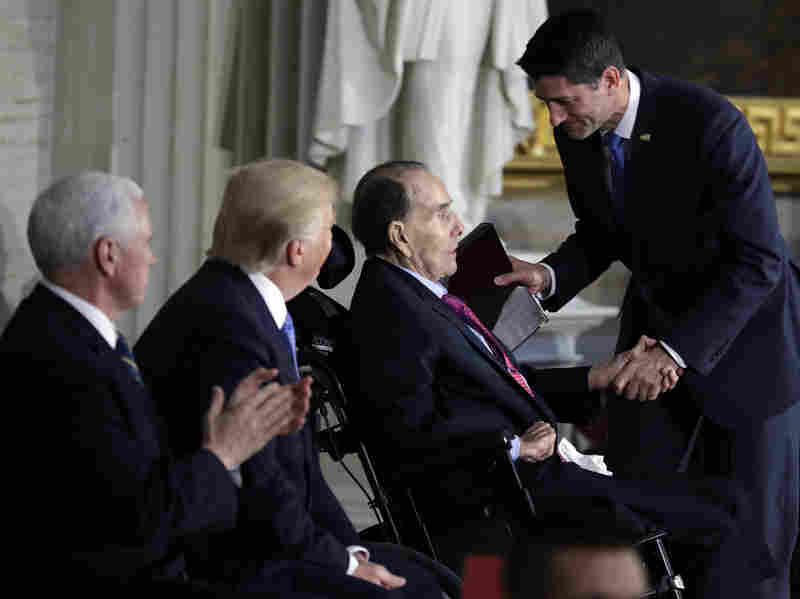 "Bob Dole always stood for what was just and what was right," Ryan said. "Because of you, America is much better." Trump called Dole "a true American hero," telling him, "good job." It takes support from two-thirds of the House and 67 senators to award the medal. Sen. Pat Roberts, R-Kan., said he got support for Dole's medal from all 100 senators in two days. "You are our hero," Roberts said. Senate Minority Leader Chuck Schumer, D-N.Y., injected a moment of levity into the proceedings, crediting Dole for the coining the phrase, "the most dangerous place in Washington is between Chuck Schumer and a camera." Noting that it had been applied to others before him, Schumer nonetheless thanked Dole for allowing C-SPAN cameras into the Senate chamber. "I never would have found as many TV cameras without you," Schumer joked. "I want to thank all those who've said such kind words about me," Dole said. "They're probably not true, but they were nice," he quipped. He also thanked his congressional aides over the years, many of whom were on hand, saying "I've always said that you're no better than your staff." Dole then turned the mic over to his wife, former Transportation Secretary and Sen. Elizabeth Dole, who read the rest of her husband's speech, mentioning the majestic view from Dole's former Senate office, one that includes the statue of Grant, the National Mall, the World War II Memorial and on to Arlington National Cemetery. "Leadership," Elizabeth Dole said on her husband's behalf, "begins with the long view." The Congressional Gold Medal has been awarded to a range of recipients, from George Washington to Rosa Parks to Frank Sinatra and is Congress' "highest expression of national appreciation for distinguished achievements and contributions." Dole served 35 years in Congress, most of them in the Senate, where he rose to the post of Republican leader, a position he held for a record of nearly 11 years. In 1996, he was the GOP nomination for president, losing to Bill Clinton. He had earlier lost two bids for the Republican nod. He was also President Gerald Ford's running mate in 1976. At the time he was seen as Ford's hatchet man, famously labeling the 20th century's armed conflicts as "Democrat wars." After losing the New Hampshire primary to then-Vice President George H.W. Bush in 1988, he called on Bush to "stop lying about my record." But in later years he mellowed, joining former Democratic rival Sen. Tom Daschle of South Dakota at the Bipartisan Policy Center they helped found. 0 Response to "Bob Dole Receives Congressional Gold Medal"